The consumer spends all his income to maximise his satisfaction it is called consumer equilibrium. It s not possible to know the consumer equilibrium by indifference curve only. For this we must know the income of the consumer and price of the goods. Therefore we should consider both indifference map and price line. If we incorporate the price line into indifference map we can get consumer equilibrium. If the consumer spends all his income on various combinations of two substitutable commodities which consists a line is called price line or budget line. This can be explained by an example. Suppose that the consumer has a sum of Rs 20 in his pocket and he want to spend it on two commodities namely coffee and cigarette. The price of coffee is Rs 2 and the price of cigarette is Rs 1. Now consumer can purchase 10 cups of coffee or 20 cigarettes or he can purchase both . As per the illustration of the diagram the consumer can spend his entire income on cigarette, he can purchase 20 cigarettes or 10 cups of coffee. If we join A and B points we get the price line. In this diagram the consumer can purchase any combination of both the commodities which comes on AB price line. He cannot purchase the point E above the price line because the consumer doesn't have at his disposal the necessary money and this point E and above the price line. Therefore any combination of the two commodities must follow on the budget line. In order to explain how the consumer achieves equilibrium or achieves maximum satisfaction we have to bring together he indifference map and the price line. 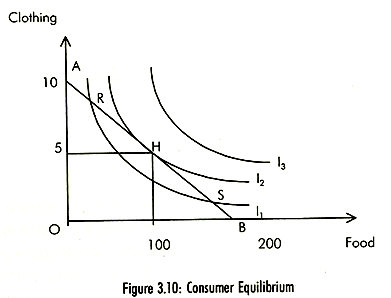 In this diagram the consumer reaches his equilibrium at point T because the price line touches the IC3 curve at this point. Accordingly the consumer can purchase OM quantity of coffee and ON quantity of cigarette with his limited income the consumer is able to purchase only on IC3 curve and he will be in equilibrium position.